Four additional free public bicycle air pumps have now been installed near to popular cycling routes in South Gloucestershire. The air pumps have been fitted in two new locations – the Bristol and Bath Science Park and The Mall at Cribbs Causeway. The two pumps located at the Science Park are easily accessible for those cycling around the A4174 ring road. The two located at The Mall are ideally placed for anyone cycling to work at the shopping centre/retail park or exploring the 14km Concorde Way route which runs from Cabot Circus in central Bristol to the north side of The Mall. The Science Park pumps are situated near the main entrance. The pumps at The Mall can be found at car park zones K1 on the north side and D5 on the south side of the shopping centre. 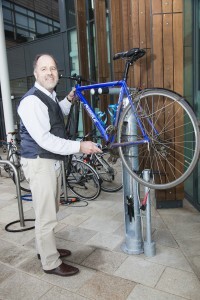 These new installations bring the total number of free bicycle air pumps in South Gloucestershire to six, with the first two installed on the Bristol and Bath Railway Path at Bitton and Warmley in July 2014. The heavy duty public bicycle air pumps provide cyclists with a convenient facility to pump up deflated tyres. The pumps are permanent fixtures which have been securely bolted to the ground, and have been designed to withstand constant use. They feature a robust stainless steel pump handle and an armoured air hose, are suitable for both types of tyre valve, and also have a handy gauge to check pressure. The pump located at the entrance to the Science Park is a full-featured ‘Fixit’ stand which also includes wrenches and screwdrivers for basic bike maintenance. Richard Pitkin, Innovation Centre Director at the Science Park said: “Since the Science Park opened three and a half years ago we have worked continually with South Gloucestershire Council and North Bristol Suscom to provide better and better facilities for the large number of cyclists we have on site. Along with ample covered cycle space, showers and drying rooms, the new cycle pumps really complete our first class cycling facilities. These new free bicycle pumps are available as part of a drive to make the West of England region cycle-friendly and improve safety for cyclists and have been funded by the Local Sustainable Transport Fund (LSTF). The pumps will be looked after and maintained by local businesses or organisations.